Note: This is just the standalone book. 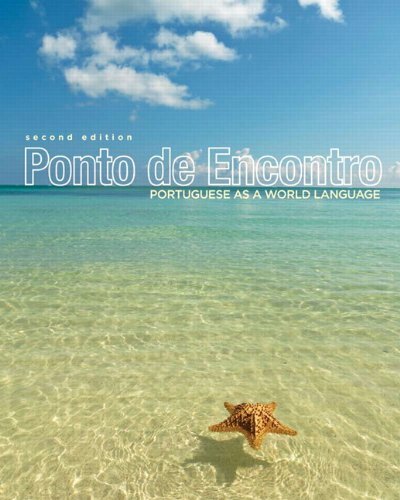 Contemporary Portuguese Language - The Way You Want To Teach It Ponto de Encontro is the first Portuguese language textbook that allows the instructor to choose to teach either Brazilian or European Portuguese. The Second Edition of this best-selling text is completely updated to reflect the 1990 Acordo Ortográfico (spelling reform), ensuring students learn how to accurately read and write in Portuguese today. Teaching & Learning Experience Balanced, Communicative Approach — Students learn to communicate effectively in spoken and written Portuguese through a variety of guided and open ended activities. Ponto integrates cultural information and promotes exchange at every stage of instruction. Connect with Culture - Offers learners a rich variety of insights into cultural, social and political realities of the entire Portuguese-speaking world. Explore Grammar - Grammatical structures are presented as a means to effective communication. Build Vocabulary - Tight integration of vocabulary and grammar presentation and exercises reinforce the focus on usage and real-life situations. Develop Skills - Extensive culture-based sections create authentic and meaningful environments for skill-development in each area: listening, speaking, reading and writing. Personalize Learning — MyLanguageLabs' proven results are now available for elementary Portuguese courses! MyPortugueseLab will be available for fall 2012 courses. View More In Dictionaries & Thesauruses. If you have any questions about this product by NA, contact us by completing and submitting the form below. If you are looking for a specif part number, please include it with your message.